For most homeowners, heat is a necessary expense. However, that doesn't mean that your heating system needs to be a major drain on your wallet. At Avery Heating & Air Conditioning, we specialize in installing a variety of efficient heating systems that will give your home the comfort you need without excessive spending. If you're interested in upgrading your home heating system, call us today at 1-844-386-0741 or click below to get started. We offer free estimates on all our installation work in Newland, Boone, Blowing Rock and throughout the surrounding areas. Oil: Oil is one of the most common heating systems available, and it is a very reliable and easy to manage heat source. Oil furnaces are part of a forced air system that evenly distributes heat throughout the home. Gas: Gas furnaces can be run on either natural gas or propane, with both offering a more environmentally friendly option than oil heating. 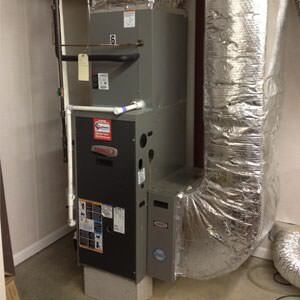 Gas furnaces generally have good efficiency, and a sealed combustion furnace will provide great energy savings. When combined with stable fuel prices, gas heating systems are an appealing option for many homeowners. Wood: Wood and pellet stoves have become an increasingly popular heating system as homeowners look to save money on energy costs. In many cases, these are supplementary systems that limit the need to use the more effective gas or oil system in a home. If you're looking to cut down on heating costs, adding a wood stove could be a good option for your home. Solar: Solar panels are viewed by many as a key energy efficiency upgrade, and in the right situation they can reduce energy bills in your home. However, solar panels will not be cost-effective on all homes. Our experts will help you determine if they're a good option for you. Radiant: Radiant heating systems transfer warmth through walls or floors rather than blowing hot into the room. Common examples of these systems are hot water baseboard heating and heated floors. While these systems are a nice addition for certain areas, they aren't ideal as a whole home heating system. If you're interested in upgrading your home heating system, the experts at Avery Heating & Air Conditioning are here to help. Our experienced professionals will evaluate your home and help you choose the right option for your needs. Call us today at 1-844-386-0741 or contact us online to get a free estimate on a heating system installation for your home. We offer all our heating services in Newland, Boone, Blowing Rock, Banner Elk, Shatley Springs, West Jefferson, Elk Park, Linville, Crossnore, and throughout the surrounding areas.